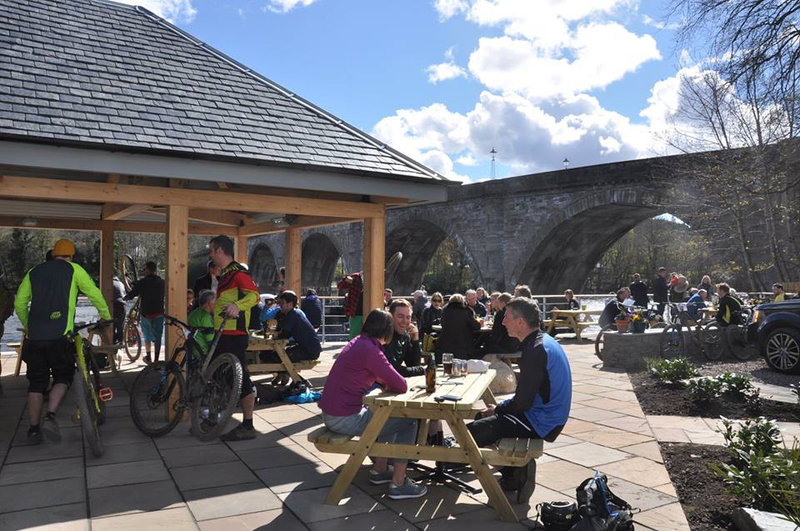 The Atholl Arms Hotel, one of Dunkeld’s landmark buildings, has expanded its operations right down to the banks of the River Tay. The 17 bedroom hotel, where Queen Victoria dined as a princess, has opened a new Garden Terrace which provides glorious views up to Thomas Telford’s famous five arched bridge, opened to the public a quarter-of-a-century before the Atholl Arms was built in 1833. Local architect Robin Baker designed the oak framed pavilion with surrounding stone walls and slate roofing. Construction work was carried out by H and H Construction. From the pavilion guests can be served meals, snacks, tea, coffee, alcohol and soft drinks. Railings have a nautical design element. Stone copings have been transformed from slab shelving found in the hotel’s basement and previously used to store fish, meat and game in the days before refrigeration. “The Garden Terrace adds an exciting new dimension to the Atholl’s hospitality offering, and makes the most of our location near the river,” Mr Sinclair added.